Aims: The SF-Qualiveen is a short questionnaire that measures the impact of urinary symptoms on the quality of life of patients with urological dysfunction due to neurological disorders. 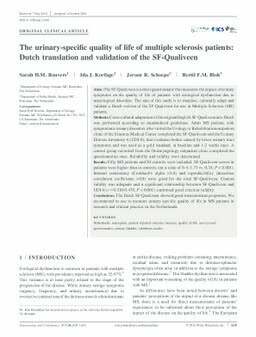 The aim of this study is to translate, culturally adapt and validate a Dutch version of the SF-Qualiveen for use in Multiple Sclerosis (MS) patients. Methods: Cross-cultural adaptation of the original English SF-Qualiveen into Dutch was performed according to standardized guidelines. Adult MS patients with symptomatic urinary disorders who visited the Urology or Rehabilitation outpatient clinic of the Erasmus Medical Center completed the SF-Qualiveen and the Urinary Distress Inventory-6 (UDI-6), that evaluates bother caused by lower urinary tract symptoms and was used as a gold standard, at baseline and 1-2 weeks later. A control group recruited from the Otolaryngology outpatient clinic completed the questionnaires once. Reliability and validity were determined. Results: Fifty MS patients and 50 controls were included. SF-Qualiveen scores in patients were higher than in controls (on a scale of 0-4: 1.73 vs. 0.34; P < 0.001). Internal consistency (Cronbach's alpha >0.8) and reproducibility (Intraclass correlation coefficients >0.8) were good for the total SF-Qualiveen. Content validity was adequate and a significant relationship between SF-Qualiveen and UDI-6 (r = 0.510-0.479, P < 0.001) confirmed good criterion validity. Conclusions: The Dutch SF-Qualiveen showed good measurement properties. We recommend its use to measure urinary-specific quality of life in MS patients in research and clinical practice in the Netherlands.